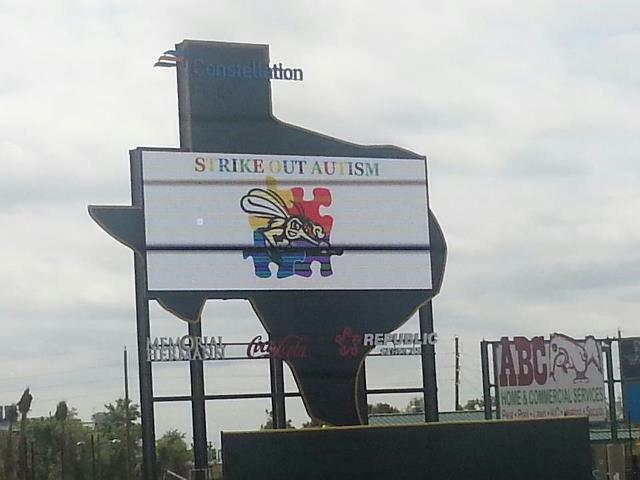 Hope for Three, an autism awareness & advocate group in Ft. Bend, organized this special event called Strike Out Autism. It was open for 100 families to come to the stadium & participate. Each child that came, so both Addy & Alex, were partnered with a volunteer to be their buddy for the day. Addy & Alex's buddies were Vanessa & Mark. They were a married couple & they were very very sweet! and the playground while Nick & I were able to go chat with friends & relax a little. and get their glove signed by some of the Skeeters players. And then they both got a balloon animal. Addy got a pink cat & Alex got a green dog/dinosaur. After the kids had played for about an hour, all the families & volunteers headed down to the field for a parade. The kids played a little catch while waiting for the parade to start. And then we all walked around the stadium in the parade. Alex thought it was pretty cool to be a part of the parade & loved that everyone was cheering & waving as we walked by. After the parade, the baseball game was starting. Hope for Three had a buffet for the families to eat but there was not anything on it that Addy liked. So we ended up leaving to get her some lunch & did not stay for the game. Even though we did not stay for the game, we had a wonderful time. It was our first time to go to the Skeeters stadium & it was really cool. They have a playground, slash park, carousel & a swimming pool & you can see the field from all of those places. We definitely need to go back & actually watch a baseball game soon! This past Saturday, I took Addy & her Girl Scout troop to camp for the day. We left Sienna around 7:15 & arrived at Camp Wind-e-mere around 8:00 which gave the girls some time to trade SWAPS with girls from other troops before opening ceremonies. (SWAPS stands for Special Whatchamacallits Affectionately Pinned Somewhere & they are little trinkets that the girls make & trade with other girl scouts.) Addy had lots of fun trading SWAPS & her favorite was a balloon with a happy face drawn on it. Around 8:45, we walked over to the flag circle for the opening ceremony. After that, we had a couple hours before our first session started so we went for a hike & explored the campgrounds. This is some of our troop standing atop Chigger Hill during our hike. Since Addy & her troop are all first year Daisies, we did not spend the night at camp. But a lot of older troops did. So during our hike, we stopped at several campsites & the other girl scouts let our troop come in & see their sleeping quarters. So they got to see inside of some tepees, flats, and tents. And here is Addy sitting in one of those tents. After our hike, we ate lunch & then waited for our first session to start. Our first session was a service project & it was to pick up brush along the trail to Chigger Hill. All the girls were given a pair of gardening gloves to wear. Addy got a pair of sticky orange gloves. As you can see from the pictures, Addy did great during the service project. She was very engaged & seemed to really enjoy picking up the sticks & helping out. I was so proud of her! Once the girls had filled the wagon with sticks from the trail, the leader of the service project pulled it over to a big open area & our girls then separated the sticks by size. They sticks were to be used to make campfires later that night. After the girls completed their service project, we moved on to the next session which was learning how to build a fire. The volunteer taught the girls about the different kinds of sticks used in a fire; kindling, tender & logs. Then she had the girls go search Chigger Hill & see if they could find some of each. This log was so big that it took 3 girls to carry it! After collecting wood, the girls were shown how to make an "A" with the wood as a base & taught the rest of the basics for building a fire. Our 3rd session for the day was Addy's favorite! It was lead by this lady, Chickadoo Suz. and the girls were able to pet them. And then they made a chicken out of a pinecone & fake feathers. Addy had her 'C' that day & C is for chicken! How perfect was that! Here's Addy's finished chicken. As always, my little artist did a super job! and empty cookie boxes to use as building blocks that they could play with. And since it was the last session, Addy & her troop got to stomp on all the boxes & flatten them. Here they are waiting til the count of 3. And here they are stomping! And then they learned a few camp songs. Addy and the rest of our girls were all pretty exhausted after a long day at camp, so we didn't make them go to the bridging ceremony, especially since they were are not bridging this year! So instead, we let them play a few games with an older troop for the last hour of the day. Here they are playing a game called 'Little Sally Walker.' Addy participated for a little bit & then she came & sat in my lap & drew pictures on some paper I had. And here is a final picture of our troop, Daisy Troop 3124. What an awesome bunch of girls! Addy was really upset when we left camp. (She was exhausted & she really didn't eat anything for lunch, just snacks throughout the day and I'm sure both of these added to her crankiness.) She was insistent that we stay and make s'mores & sleep in a tent. Hopefully next year baby girl, hopefully next year! Friday night we went to an outdoor movie night at Addy's school. The PTO set up a big blow up screen & played Wreck It Ralph. We got there about an hour before the movie started and met up with our Girl Scout troop. We sat on blankets on the ground & ate popcorn & candy. About 30 minutes into the show, Alex was ready to go. He leaned over to me & said "Mommy, this movie is dangerous. We need to go home." So we did. But we sure had a lot of fun while we were there. Saturday morning, Addy had a baseball game. As always, she played great & really enjoyed herself. And this time, they had more Angels in the Outfield to help out with the kids so that us parents could sit back and watch. Here is Addy with her awesome Angel Will. After the game, we ran up to the pet store to look at the animals. Addy could stay & watch the mice all day long. Look at this little guy. We almost brought him home! Sunday we went downtown to the Houston Autism Festival. The kids got their faces painted while I looked at the booths and got some information on different therapy centers in Houston. Alex got his face painted like a Ninja Turtle & Addy got her's painted like a cow. She's 'mooing' in this picture. 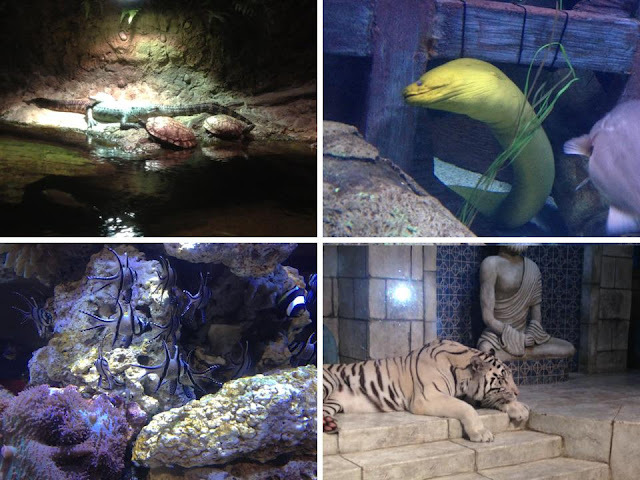 After the Autism Festival, we walked across the street to the Houston Aquarium. It was our first time to go there. Of course Addy loved seeing all the aquatic animals but I was not very impressed. And since I was disappointed with the Aquarium & it was on the way home, we went to the zoo. My plan was to first check out the parking lot & see how busy it was, but Addy saw the zoo signs & then we really didn't have a choice anymore. and looked at the animals & fed the giraffes. Sadly my phone went dead early on so I didn't get to take very many pictures at the zoo. Needless to say, we were exhausted by the end of the weekend & ready for Daddy to get home.